Q: When did you know you wanted to be a professional musician? I believe you took a little different route to rock and roll than most. 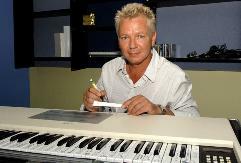 When and how did you get your own start in the music industry and how did Icehouse come to be? Iva: It all started when I was a boy, about 5-years-old living in the country, and I heard the local Scottish pipe band playing. I fell in love with the pipes, learned to play them, and was playing in the band by the age of 8. When we moved to Sydney, and I went to High School, the music teacher encouraged me to learn the oboe. I won a scholarship to the New South Wales Conservatorium of Music (Australia's leading Music Institution) at about the age of 14, and it seemed clear from then that I would be a professional oboist. I was playing professionally by 16, and by the age of about 20 had played casually with the Sydney Symphony Orchestra (Australia's leading orchestra). However, at roughly the same age as I began oboe lessons (13) I taught myself the guitar. I played with two other local boys in a jug (Skiffle folk) band called "Lucy Fields". Following my time at school, I was "discovered" by a music publisher and recorded and released two unsuccessful singles through RCA. 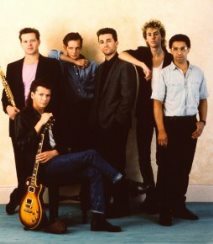 Ultimately in my early 20's I gave up playing the oboe and was in the process of adapting my acoustic guitar playing to electric when I met bass player Keith Welsh and the original line up of what was to become Icehouse was formed under the name of Flowers. Following the success of our debut album, the band changed its name, and by the time the second album was released the lineup had changed and expanded to a six-piece band, known from then on as Icehouse. 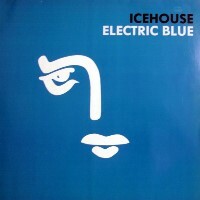 The band's name of Icehouse was adopted in 1981 from a single they had released of the same name. That name was reportedly inspired by an old, cold flat of a two-story mansion that Davies lived in across the street from a disheveled building which turned out to be a half-way house for psychiatric and drug rehab patients. Q: Did you have aspirations of worldwide success right from the start or were you just focusing on Australia at first? Iva: The band had aspirations, as did most Australian bands, to have international success right from the beginning. With the success of our first album in Australasia came interest from overseas labels. The album was then released internationally and that was followed by our first international tour, starting in the UK, then on to Canada and USA. Q: "Electric Blue" was the band's biggest hit in the U.S. and was co-written by you and John Oates. First, how did you and Oates end up coming together to work on this song? Did he come to Australia? What can you tell us about collaborating with John Oates? 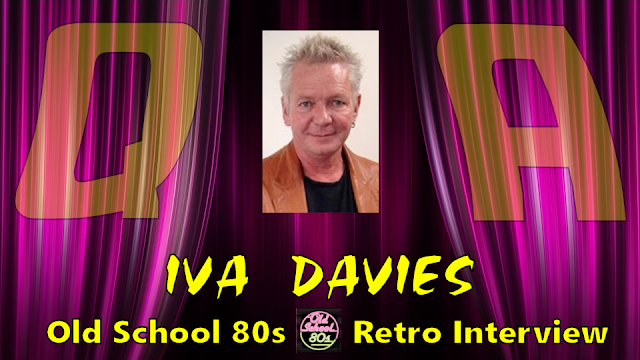 Iva: John Oates approached me to say hello in the Adelaide airport. Measure for Measure. I was staying at the Mayflower Hotel in New York. 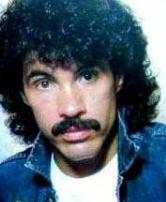 John Oates tracked me down by phone and suggested that we write songs together. Following the conclusion of touring commitments, John packed a container of his equipment, and shipped them to Sydney. We spent about 10 days in my Sydney studio creating "Electric Blue". At the time he returned to the U.S., the song was still unfinished but the main skeletal details were there. Even in that unfinished state, John was convinced that it would be a hit. He made me promise that if Icehouse didn't use it as a single to let him know because he would want to use it as a Hall & Oates single. 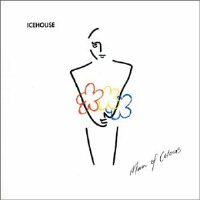 Luckily for Icehouse, I had no trouble convincing our management and record company that we should include it on the next album, Man of Colours, as a single. Q: Please take us back to when "Electric Blue" was written and recorded. What is the back-story about how it was conceived and written? What inspired the title and lyrics? How did the song evolve as you put it together? Iva: One of the first pieces of detail created, well before the construction of the lead vocal line, was the falsetto backing vocals. These were suggested, and ultimately sung, by John Oates. I was a bit surprised by him focusing on that sort of detail so early in the process, as I had always approached backing vocals as a bit of a last minute "add on". 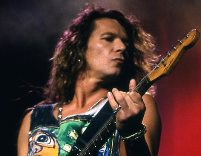 However, John is a specialist in creating and performing backing vocals, and so what he created at that early stage was what came to be one of the key "hooks" of the song. The title "Electric Blue" was a phrase included in a very early Tyrannosaurus Rex (T-Rex) song called "Jewel". I was a big fan of T-Rex, including the early albums released under the name Tyrannosaurus Rex. I first heard the song when I was about 20. I was taken by the description of a girl's eyes as "electric blue". Q: Did you have any feeling that the single was going to be something special when you wrote it or recorded it? Did you ever expect that it might breakthrough as it did on the American pop charts? Iva: Although John Oates seemed quite convinced early in the writing of the song that it would be a hit, I was never as sure about it. However, by the time it was released in the U.S., it had already achieved #1 success in Australia. I had great belief in the song "Crazy", which was the first single released from that album. Although it only peaked at #14 on the U.S. charts, I believe that "Crazy" blazed the path that the second single "Electric Blue" enjoyed the benefit of. Q: What are your feelings regarding "Electric Blue" today 27 years later? Iva: It, of course, has a special place for me as it achieved the highest place we ever enjoyed on the U.S. charts. Although it is perhaps not the most "substantial" song we ever released, in terms of lyrical gravity and so on, I believe it is a very well-crafted song, and it was an honor to have the great talent and experience of John Oates contributing to it. Working with him was certainly a career highlight for me. Q: Your video for "Electric Blue" received lots of exposure on MTV back then. What memories can you share with us about making the music video for it? Were you conscious of the image/fashion you were trying to convey? Iva: The video was one of a number from that time directed by U.S. director John Jobson. It was shot on a rooftop in central Sydney. I'm not sure that we were consciously crafting an image so much as enjoying the various clothes that were available at the time. I bought a lot of clothes in London, especially from designer Scott Crolla. I also bought a lot of leather clothing by Sydney designer Lynda Carr. I believe we tried fairly consciously to steer clear of a lot of the more "signature" '80s fashions, just as much as in the early days. Although we were regarded as part of the Australian "punk" movement, we also avoided most of the clichés of punk fashion quite deliberately. Iva: By far, the most exciting part of that time was the explosion of music technology. It seems almost by accident that I ended up being an unwitting pioneer of a lot of that technology. 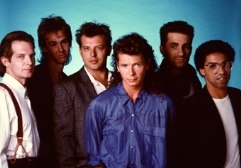 The first album (Icehouse by Flowers) was probably one of the first albums recorded with a "click" track, which is now industry standard practice. I can be sure of this as we had to generate a tempo click in quite a convoluted way, using a white noise burst from a Mini Moog synthesizer which was triggered by a simple clocking add-on unit called a "Sample & Hold". This "click" sounded roughly like a strike on a closed drum hi-hat, and can be heard in the fading moments of the recording of the song "Icehouse" on that album, as I deliberately left it in the mix. I can be fairly sure that this use of a "click track" was quite an unusual idea at the time, because no drum machines or electronic metronome technology existed at the time, and the way we had to go through such an unusual set of processes to generate a click. That album also features the Prophet 5 synthesizer, which was the first synthesizer to be able to play more than one note at a time (it could play 5-note chords, hence the name). Our second album Primitive Man features the Linn Drum Machine, which was the world's first drum machine that used real digital recording of real drum strikes. The song "Hey, Little Girl" actually features the very first prototype of that technology, which was loaned to me in the studio in Los Angeles, and personally delivered to me by the inventor, Roger Linn, himself. The third album Sidewalk features the very first sampler technology. This, believe it or not, was an Australian invention, created in the Sydney suburb of Fairlight. Sampler technology was probably, apart from the actual invention of recording itself, the most influential piece of technology in the history of music. The Computer Musical Instrument, or Fairlight, was an extraordinary technological achievement at the time. By complete accident, our management's offices were on the second story of the actual work space where the Fairlights were assembled by hand in Sydney. In 1982, this machine was a $32,000 investment for me, but proved to be well worth it. Alan Parsons, Annie Lennox, Barry Gibb, Billy Gibbons, Bono, Boris Blank, Brian Eno, Brian Wilson, Chick Corea, Daryl Hall, David Bowie, David Gilmour, David Hirschfelder, Elvis Costello, Geoff Downes, Hans Zimmer, Herbie Hancock, Howard Jones, Iva Davies, Jan Hammer, Jean Michel Jarre, Jim Kerr, JJ Jeczalik, John Paul Jones, Joni Mitchell, Kate Bush, Keith Emerson, Laurie Anderson, Lindsey Buckingham, Mark Knopfler, Mark Mothersbaugh, Midge Ure, Mike Oldfield, Mike Rutherford, Nick Rhodes, Peter Gabriel, Roland Orzabal, Sir George Martin, Steve Winwood, Stevie Wonder, Stuart Copeland, Thomas Dolby, Todd Rundgren, Trevor Horn. Our fourth album Measure for Measure is one of the first three fully digital recordings ever made, which of course was created for the then brand new technology of compact discs (CD's). It was recorded on the first digital multi-track tape machine, The Mitsubishi 32 track, and then mixed to Mitsubishi digital 2 track. I believe the other two albums were one by Dire Straits, and, believe it or not, one by Cliff Richard! And so it goes on. The 80s was an incredible time for innovation in music technology, and produced an absolute flood of very fun musical gadgets and toys to play with. 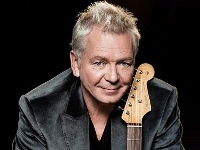 Iva: Icehouse stopped actively performing in 1994, but resumed again in 2010. However from 1994 on I was involved in a series of quite high profile projects. I had written my first contemporary ballet score, "Boxes" for the internationally renowned Sydney Dance Company in 1985 (using mainly Fairlight). I had also, in 1984, (using mainly Fairlight once again) composed my first score for a feature film Razorback (directed by Russell Mulchay, who was probably the world's leading director of music videos at the time). In 1995, after I had stopped actively touring, I wrote another ballet for the Sydney Dance Company, "Berlin". The two ballets, "Boxes" and "Berlin" are the Sydney Dance Company's most successful works to date. When Graeme Murphy, the creator of the company, Artistic Director and choreographer retired in 2007, he chose a return season of "Berlin" to finish with. Over the years, I have been involved with a number of other high profile projects. They include "The Ghost of Time", a 25-minute expanded orchestral piece based on and including my 1982 song "Great Southern Land", which was commissioned by the City of Sydney to be performed on the forecourt of the Sydney Opera House in the 25 minutes leading up to the countdown of the Millennium. The performance which featured myself, virtuoso violinist Richard Tognetti, the Sydney Symphony Orchestra and Taikos (Japanese Taiko drumming ensemble based in Sydney) was broadcast on international television to an estimated 4 billion people. "The Ghost of Time" was being watched by Australia film director Peter Weir, who approached me in 2003 to create similar music for the score of his highly successful blockbuster move Master and Commander: The Far Side of the World. The film went on to achieve ten Oscar nominations. I've been involved with other writing projects along the way, which include the score to the largest budget two-part telemovie ever produced here, the British/Australian joint production The Incredible Journey of Mary Bryant. I'm not sure what to say about "goals" as such. Much of the last 17 years or so have resulted in projects which seem to have presented themselves as unplanned opportunities, which also in turn have turned up some amazing highlights. For the ballet score "Berlin", in which I produced cover versions of seven songs by iconic writers such as David Bowie, Bryan Ferry, and David Byrne, I had to get permission from the actual writers themselves (as opposed to their publishers, record companies or representatives), to use the songs in a work for the stage. ("Grand Rights" are the actual copyright description applying to theatre works). The highlight song nearing the end of the ballet is the Velvet Underground's "All Tomorrow's Parties" written by Lou Reed. Lou Reed proved very elusive and in desperation we sent a tape of my version to his office in New York hoping against hope that he might actually bother listening to it. To my absolute shock, my fax machine went off during the night about a week later. It was from Lou Reed's New York office, and contains this quote from Lou Reed himself: "Regarding "All Tomorrow's Parties": Congratulations! I couldn't have loved it more! I am honored to have such talent interpreting my music". I certainly consider that compliment a career highlight, and that fax is framed, mounted on my wall, and one of my most prized possessions. Q: I read a quote from a 1982 Penthouse interview where you discussed being a musician: "If you like being adored, impressing women and getting free drugs all the time, then I guess it's attractive. If you don't you're stuck with bad hours and bad pay." Other than obviously the "bad pay" part not holding true, what would you say about being a rock star 30+ years later? Iva: Well, I'm very glad that I managed to avoid some of the pitfalls of a successful career as a rock star, but I can also say that, apart from being incredibly exciting, a lot of very, very, very hard work went into it. I have had some incredible opportunities, like touring with David Bowie at the absolute peak of his international career, and standing in the studio at Air Studios, London, next to Brian Eno as we sang my backing vocal parts on "Cross the Border" together. It's also fair to say that that '80s provided an incredible time for musicians with the explosion of technology, of MTV, and with such an intense period of creative energy. So all in all I feel very lucky to have been in the right place at the right time. 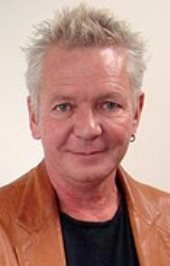 Q: What else is Iva Davies up to nowadays? Musically and otherwise? What can we expect in the future? I am also about to start writing with the youngest member of the band, Michael Paynter, who is an enormous talent. We have no idea where that will lead, whether the songs might be used by myself, Michael, or some third party, but it will be an interesting experiment. I am so pleased that Iva was able to take some time to answer some questions so I could share them with you here. Special thanks to Keith Welsh for helping coordinate this opportunity. You can find out more and keep up with everything Iva and Icehouse have going on at his official Icehouse-IvaDavies.com website. 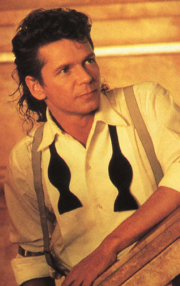 I want to take this occasion to again thank Iva Davies for his contributions to '80s pop culture especially through Icehouse and, even more, for going back to the '80s with us here for a little while as well.